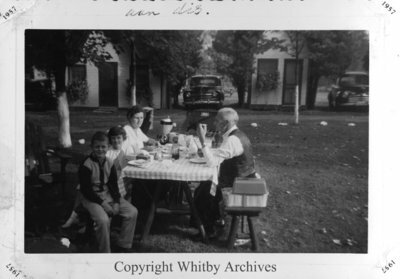 A black and white photograph of the Smit/Geldof family eating at a picnic table at the Algoma Tourist Camp in 1957. From left to right: Hank Smit, Willie Smit, Francine Smit and Frans Geldof. Top of photograph words are illegible. Algoma Tourist Camp, 1957, Willem Smit. Whitby Archives A2014_026_005.